For young kids, the words LEARNING and FUN do not always go in the same sentence. This colorful board game will challenge your child to hop around a backyard, collecting Easter eggs as he goes -- but he can only keep the each set of eggs he finds if he can correctly complete the basic addition problem that goes together with each set of eggs. The activities on the activity pages cover a variety of topics including pre-reading skills, listening games, visual discrimination activities, sorting activities and math games. Your child will be so engaged by the adorable pictures on the page (including cute baby chicks, delicious chocolate bunnies, colorful Easter eggs, lovely spring flowers, and more) learning will be fun! Plus, at the bottom of each of the 21 activity pages there is a suggestion for an extra activity you can try at home with your child this Easter holiday to continue the learning. Best of all, the entire Easter Activity pack, including the board game, is totally free! 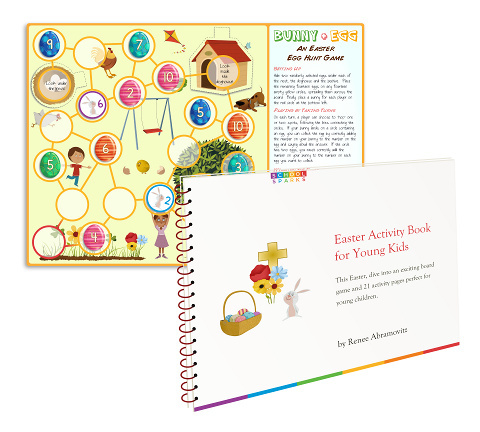 The activity pack (with the board game included on pages 4 and 5) is available on the Easter Worksheets section of the School Sparks website. While you're there, consider printing any of the other 500+ free kindergarten worksheets available on the website.